Robin is a writer/photographer and an expat in Spain. He blogs about the trials, tribulations and triumphs in Tarifa, Spain! Your blog is not just another blog but full of poerty not to mention fabulous pictures. One of a kind which I always enjoy. I regularly look forward to your weekly chronicle of your latest shenanigans. For a photographer, you're a darn good writer. I think this is the best written blog I've come across. Beautiful photos too. Who needs colour photos - this warm, funny blog paints pictures with words and the line drawings add stylish charm. Every post draws you in like a book you can't put down. Always nicely written and definitely a Spain I know and recognise immediately. Keep it up. Robin is in a class by himself with exceptional storytelling & photography. He's funny, thought-provoking, insightful and full of surprises. So yes, this blog absolutely has what it takes to win! Poetry in words and photos! 2 years of beautiful writing and photography - thank you, Robin! Your blog posts always make me smile, Robin - excellent photography too. Really captures the joys and trials of being an expat. Really lovely writings with a cheeky little quirkiness, which I thoroughly enjoy each and every time! 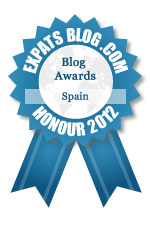 Robin writes heartfelt, personal, funny stories which show another side of the expat-in-Spain experience. And his photos are prretty good too! Alhough I have only recently discovered RobinÂ´s blog, I was immediately drawn in by his warm, personal style of writing, and can recognise many of the amusing tales from my own experiences. Tariffa and the surrounding countryside is an area of Spain not to be overlooked - much like this blog. I enjoy reading this ... it's intimate voyage of cultural discovery!